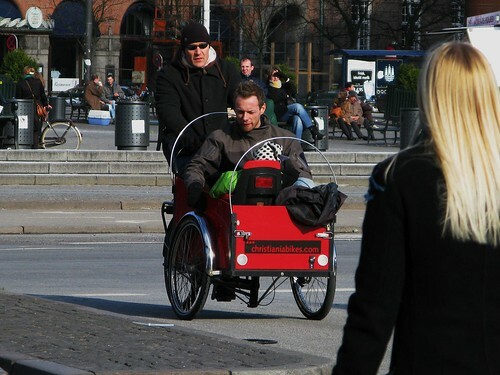 Here's a common sight in Copenhagen. 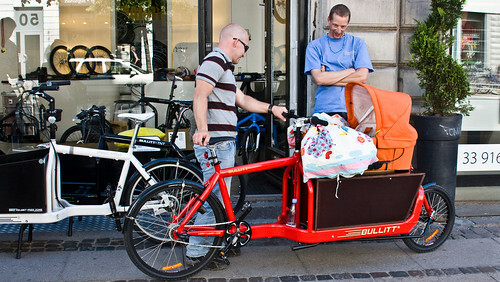 A newborn child in an auto-seat on a cargo bike. Having kids means you still have to get around the city and cargo bikes are our version of SUVs. 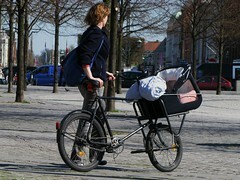 Our reader Kari sent a link to a Treehugger piece called When Should Tykes Be On Bikes? The author tries to be balanced, but the tone is typical of Emerging Bicycle Cultures where doctors, among other quirks, still tell women not to cycle when pregnant [it's virtually prescribed in Denmark]. 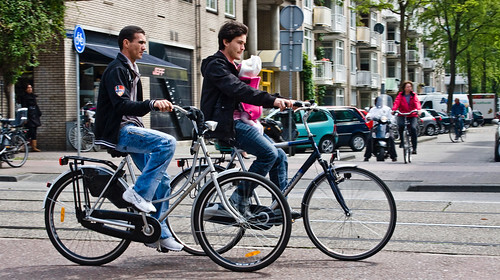 In Denmark, according to the traffic laws, children are not allowed to cycle ALONE on the bicycle lanes until they turn seven. Up until then they must be accompanied by an adult. My boy was rolling along the bike lanes to daycare and back every day from the age of three and a half. With training wheels until he was about four and a half. It's all about education and spending time teaching your kids the basics. 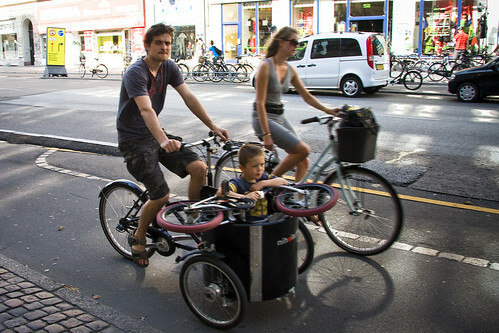 There are few limitations to transporting kids by bicycle/tricycle when they're small. 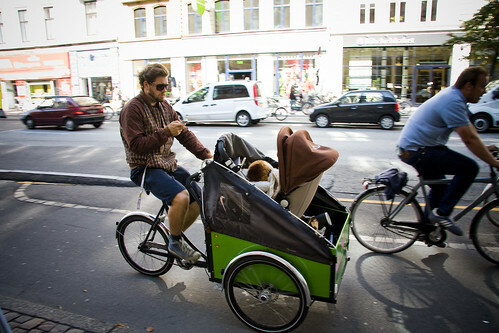 This chap took the top half of the baby pram, which clicks onto the bottom half, and made a clicking system on the top of the box of his cargo bike. He rolls around with his four-month old son [at the time] lying happily looking up at him. What a wonderful way to travel. Staring up at your dad's smiling face and at the new world floating past, all while being rocked gently by the soothing movement of the bicycle. Beats sitting inside a car filled with hydrocarbon particles. Just strap the baby carrier on your Short John or get creative with the pram. Here's a bike seat for the back rack put inside a cargo bike. Or, just use a sling like people have used for a millenium or two. Like in this shot from Amsterdam. 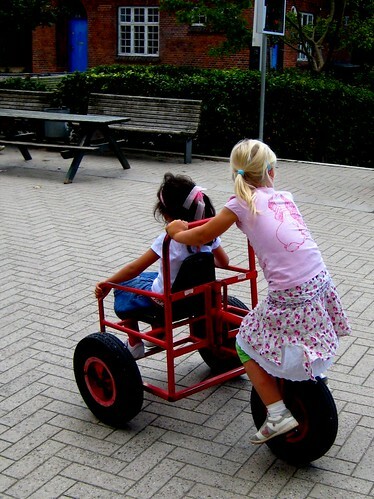 For the older kids, most schools have a variety of bikes for them to play with. 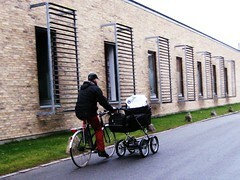 As you can see above, cargo bike training starts early.